Comparing the top ten dow dogs to the top ten of any subject index, sector, or collection gives a clear instant picture of the relative volatility and risk as displayed by the gaps between dividend and price. For the past year the Dow has shown itself to be overbought as the aggregate single share price has pulled further ahead of dividend from $10k invested as $1k in each dow dog. Q: How do you catch a dog? A: Follow his tracks! 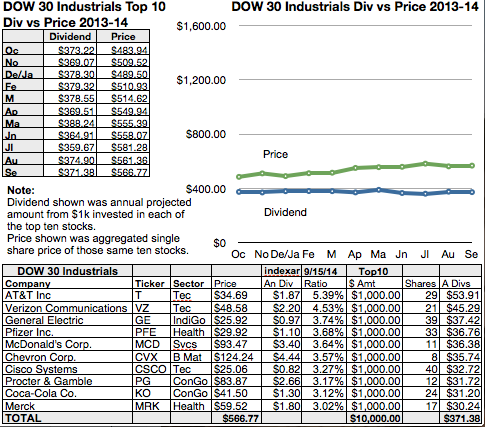 Charts of Price vs. Dividend let the catcher see the dog tracks.